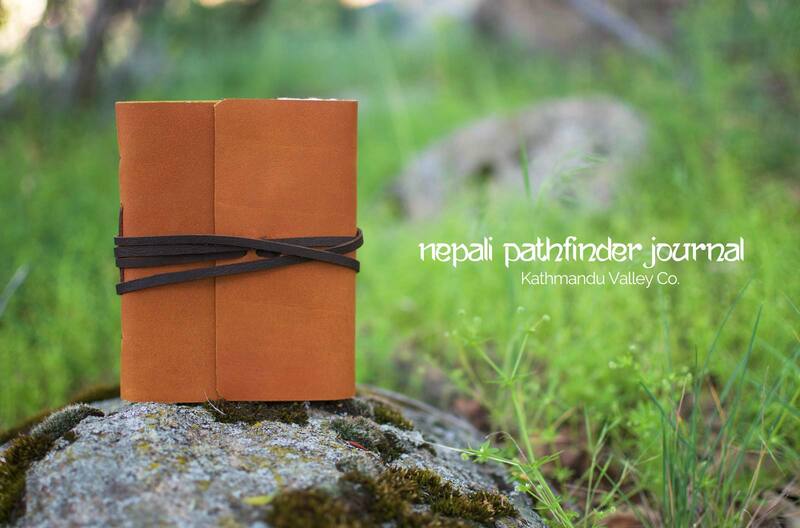 Nepali Pathfinder Leather Journal with Handmade Lokta Paper | Kathmandu Valley Co. 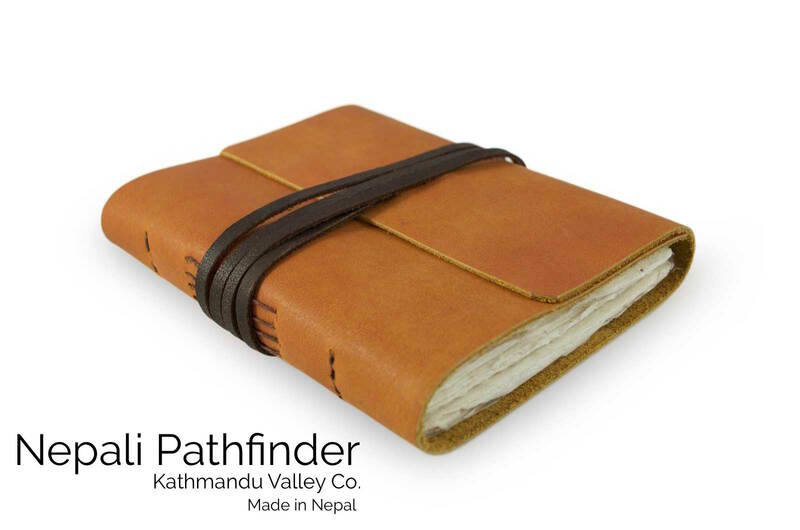 The Nepali Pathfinder Leather Writing Journal is made with Lokta Paper. Handcrafted in the Himalayas and used anciently for sacred texts, hand-made Lokta paper has been a staple of Nepalese artisans for centuries. The oldest surviving Lokta paper document is a religious text, a copy of the Karanya Buha Sutra Buddhist text estimated to be 1,000 to 1,900 years old. Lokta paper is made from lokta bushes which grow on the southern slopes of the Nepali Himalayas between 5,250 and 13,000 feet. When properly cut, the bushes can produce three to eight new, fast-growing shoots making Lokta paper one of the most sought after non-tree papers. Lokta paper is not treated with bleach or other harmful chemicals used in manufacturing of other papers. Once cut, the inner bark of the Lokta bush is cooked into a mash to soften the fibers. The mash is then hand applied to boxed screens and sun-dried in the rural, high altitude villages of Nepal. The paper is then carried down the mountain by pack animals and is then assembled into the journal in Kathmandu, Nepal. A Path of Natural Beauty. Lokta paper has a beautiful texture containing natural flecks from the outer lokta bark and can vary slightly in thickness from page to page due to the unique handcrafting process. The paper is acid-free and is widely regarded as one of the world’s finest hand-made papers. 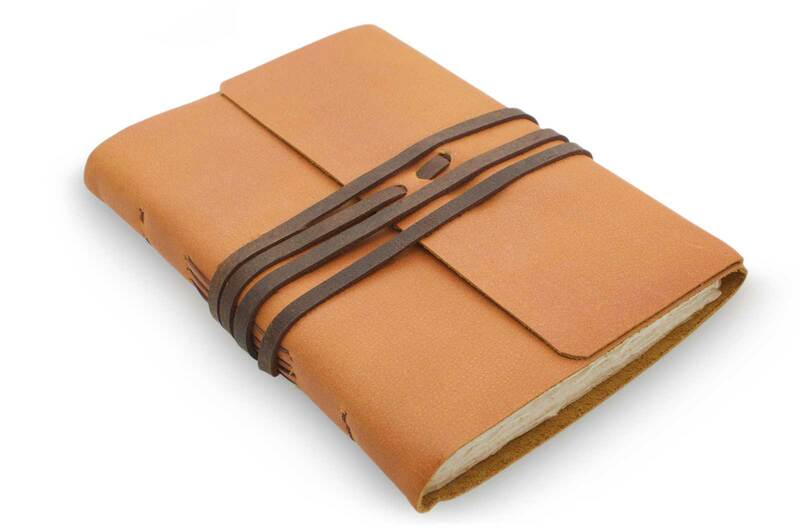 The paper’s deckled edges (rough cut), and leather closure makes this journal an international favorite. Lokta bushes grow on the southern slopes of the Himalayas of Nepal. Mimosa bark and black walnut husks are used to tan the water buffalo leather. Lokta bushes regrow quickly after being cut, regaining full height in 5-7 years. Traditional Deckle-edge pages (similar to rough cut) add to the vintage feel of every page. Modern papers are bleached to gain brigtness, our paper is bleach free and acid-free and retains its natural color. 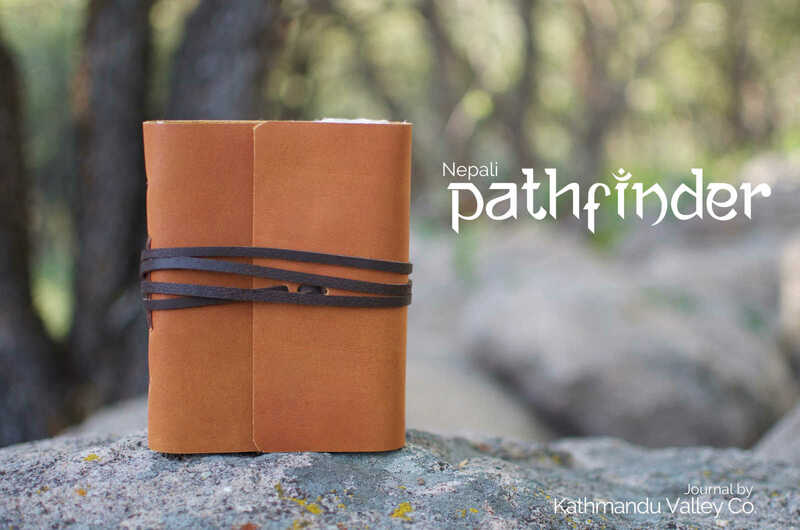 Large or small, the Nepali Pathfinder Journal is ready for any Adventure. Use it as a sketchbook, a travel journal, prayer book, or notetaking at home or in the wild. Using the time-honored tradition of vegetable-tanning, the beautiful caramel color of the water buffalo leather is created from using mimosa bark in the tanning process. Vegetable-dye colors can vary slightly from season to season, making each journal one-of-a-kind. The dark brown leather of the closing strap is tanned using walnut husks. 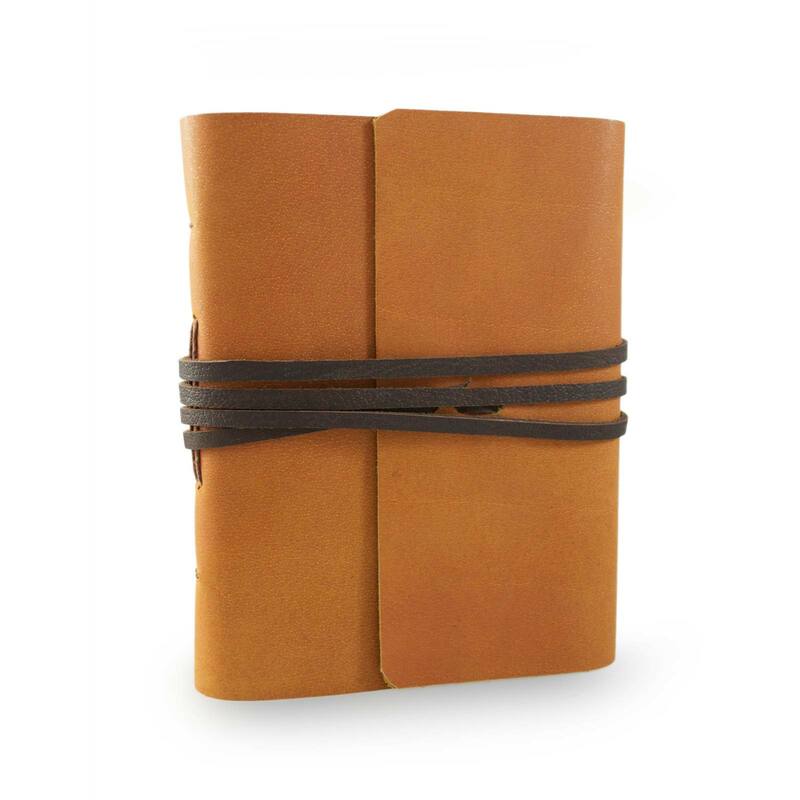 Include the Nepali Pathfinder vintage leather journal in your next adventure. Thank you for helping to preserve a 1,000 year old tradition in Nepali paper making and helping to support those affected by the earthquake that struck Nepal on April 25, 2015. Our journals feature hand made Lokta paper. 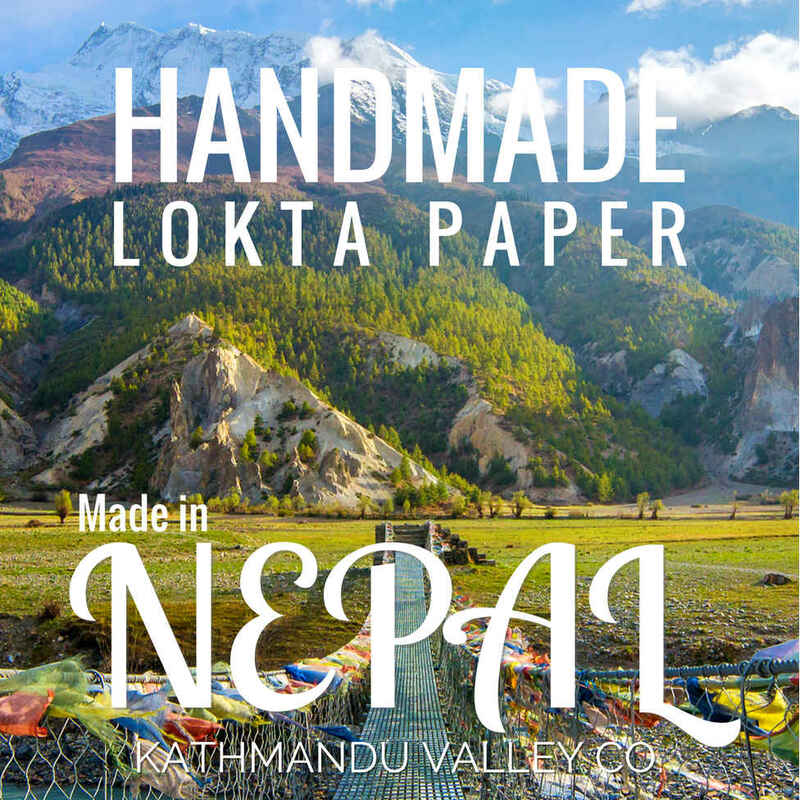 Handcrafted in the Himalayas and used anciently for sacred texts, Lokta paper has been a staple of Nepalese artisans for centuries. The paper is made from Lokta bushes which grow on the southern slopes of the Nepali Himalayas between 5,250 and 13,000 feet. When properly cut, Lokta bushes can produce three to eight new, fast-growing shoots making Lokta paper one of the most eco-friendly, renewable, non-tree papers. The paper is not treated with chemicals and is hand made in rural, high altitude villages of Nepal. Where will your adventures take you? Whether it's exploring the high altitudes or traversing the plains, make sure to take your perfect note taking companion. Our rugged yet elegant journals are the perfect place to capture the moment on paper. Paper with a 1,000 year old tradition. Join our mailing list and receive a coupon code for 10% off. Welcome! Your coupon email has been sent and will arrive soon.